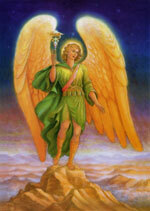 Raphael is the healing ArchAngel. His name in Hebrew means “God Cures”. He represents the qualities of truth, concentration, and healing. His ray, emerald green, is the color of spring renewal and rejuvenation. From a painting by Marius Michael-George. Art and Text Provided by Ascension Mastery International. Above Text provided by The Queen of Angels Foundation.